Every group—whether it’s a club, a corporation, a homeowner association, or a church—has its share of problem people and detractors. Such can be touchy, irritable, irrational, unreasonable, contentious, or legalistic. Their words may hurt us deeply. Their actions may confuse us greatly. So how do we handle these pesky folks? Most importantly, what should we do or not do with those who name the name of Christ but act like pests? 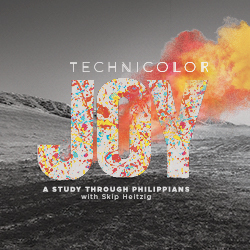 In the series Technicolor Joy: A Study through Philippians, we learn how to find joy in the most unlikely places as we discover that God can add color to the most black and white moments in life. What does it take to steal your joy? To answer that question honestly, you would need to discover what you're passionate about--what drives you and what your expectations of life are. Why is this so important? Because things won't always go your way. Unfavorable winds will toss the ship of your life around on the ocean of circumstances and heartbreaks. What do you need then? The right perspective! Let's learn these truths from Paul's prison cell in Rome. Love is the subject of more songs than any other topic. It's a word that falls off countless lips effortlessly and often without thought. But as someone noted, "One of the great illusions of our time is that love is self-sustaining. It is not. Love must be fed and nurtured, constantly renewed." The great apostle Paul had a deep love for the Philippian believers, and they for him. But love must be understood and developed intelligently. On this Mother's Day, when we celebrate the unique love of a mom, let's also consider how our love can become mature and God-honoring. No matter what you may do for a living, there is a higher purpose for your life. No matter what you do for work, God is at work in you and through you. You may have a career in mind, but God has a calling in mind. These are not contradictory paths but complementary ones. The apostle Paul assured his audience of God's work collectively, personally, and practically. We are the objects as well as the instruments of God's work in the world. You've heard it before. Someone excuses his or her crude behavior by saying something like, "Well, I'm no saint, but I do the best I can." Or, "She's so wonderful; she's a saint!" The idea most folks have is that saints are those who've died and attain special status because of their unusual accomplishments while they lived on earth. Nothing could have been further from Paul's mind when he wrote this letter to living "saints." I hope you're one. Life doesn’t have to be easy to be joyful. In fact, ease of living and joy of heart have little to do with each other. Joy is not the absence of trouble but rather the presence of Jesus. Paul’s letter to the church at Philippi is a letter dripping with joy and surprisingly so—it’s not what anyone would expect given the circumstances surrounding the author and the recipients. As we dip our toes into the joyful waters of this epistle, it’s my prayer that your smile will grow bigger and your heart will become lighter. The great mission worker Hudson Taylor was often refreshed by times of prayer. His son noted, "For forty years the sun never rose on China that God didn't find him on his knees." Someone called prayer the gymnasium of the soul. When was the last time you had a good "workout"? Today we delve into the mysterious cooperation of the divine and the human and consider the last topic in our White Collar Sins series--prayerlessness. Overindulgence has become a hallmark of our modern American culture. Our bodies are constantly alive with conflicting desires and drives. The temptation to eat too much, drink too much, or indulge in any number of things is constant. And it is also trivialized. So what if a person eats a little too much? It’s his body! It’s her life! Or is it? How can we bring honor to God with our bodies? Is caring for them carnal, or is it a responsible activity of stewardship? The sin of gossip has never made it into the same lists as murder and manslaughter. It's regarded as one of the "little sins" that even Christians are unwilling to avoid. But gossip is in the same family as murder because it assassinates a person's character. It destroys reputations, disrupts families, divides friends, and causes heartbreak. And the problem isn't just in the speaking but in the hearing as well. Let's look at a direct command not to gossip. We all know someone who has become embittered in life. They have planted kernels of unresolved anger and resentment and have become entrapped by the overgrown jungle of the bitter fruit it has created. To choose the bitter path (and it is a choice) is to walk down a self-destructive road that banishes peace and promotes self-centeredness. Let’s consider several Scriptures and the four attributes of a heart poisoned by bitterness. Some attitudes can go undetected, at least for a while. You can't see someone committing envy or having resentful thoughts. But envy is detrimental because it blinds us and makes it impossible for us to think clearly. It discolors everything around us and steals our peace. Some know what it’s like to be envied, like Marilyn Monroe who once quipped, "Success makes so many people hate you." But most of us from time to time struggle with envying someone else. The first in our list of White Collar Sins will be laziness—showing a lack of effort or energy, the unwillingness to act or, in some cases, even care. Though many would smirk at this as being petty or trivial (after all there are much worse things in the world), the Bible itself addresses it as being substantial since many other lives can be affected by it. Laziness grows on people; it begins in cobwebs and ends in chains. Someone remarked that our sense of sin is in proportion to our nearness to God. We’re usually good at being aware of blatant wickedness, but what about less obvious infractions? Are we willing to point fingers at others for flagrant iniquity while coddling our own vices? The truth is that many are too Christian to enjoy sinning while being too fond of sinning to enjoy Christianity. My purpose in this series isn’t to condemn anyone. I hope to stimulate a heart for holiness for a fulfilled life and happy relationships. To start off this series, consider five characteristics of sin. We have spent twelve weeks examining the remarkable nature of predictive prophecy. We’ve considered the chances of one person in history fulfilling the precise forecasts about the then-coming-Messiah made by the Old Testament prophets. The chances of over 300 predictions all coming true in one individual defies all the odds and challenges the willful unbelief of any detractor. Today, on this Easter Sunday, we especially rejoice that death has been conquered by the same predicted One whose life, death, and resurrection set Him apart from anyone else. Of all the Old Testament writings that predict the Messiah, Isaiah 53 is the Grand Canyon of the prophetic landscape. It captures the person and work of Christ with precise clarity, and it unfolds His atoning sacrifice on the cross like no other text. Hundreds of years before Jesus was born, His death was announced and detailed. Isaiah the prophet shows us that Jesus would be the perfect servant of the Father in dealing with the most serious problem of the human race. Today we begin to examine the cross in light of Old Testament prophecy. Even though the expectation of the Jews at the time of Christ was for a conquering Messiah, the Scripture also paints a picture of a suffering and dying Messiah. This means He would need to come two separate times. In their rejection of Jesus, the people were actually fulfilling the very Scriptures they denied as referring to Christ. Today let’s stand at the foot of the cross and not only examine the event, but also examine our hearts. In addition to your download(s), you will receive email updates and special offers from Connect with Skip Heitzig. The pages of Scripture are stained with blood—every book, in both the Old and New Testaments. Follow the blood-stained path from Genesis to Revelation in this unique journey through the Bible along the scarlet thread of redemption, and discover the awesome lengths God went to to restore fellowship with His crowning creation. Learn about what the future holds with the What's Next? Briefing Package Special resource from Connect with Skip Heitzig. This package includes Skip Heitzig's book You Can Understand the Book of Revelation, a message from Skip called "The Coming Deception," and two booklets by Skip: Jesus Loves Terrorists and Standing Firm in Unsettling Times. Do you need some change in your life in 2018? Be challenged to make a personal revolution this year with an impactful booklet by Skip Heitzig titled A New Year's Revolution. Then learn about the hard-to-grasp topics of the Christian faith with a special compilation of teachings by Skip called What You Want Them to Know. Investing yourself in the Word of God is the best thing you can do for your personal walk with the Lord. It's the Word of God that does the work of God by the Spirit of God in the lives of the people of God. And the more you get to know your Bible, the more you get to know your God. That's why I want you to join me for the 30K 30-Day Challenge. This challenge will launch you into the pages of the New Testament with thirty days of supercharged study, giving you a greater grasp of Scripture.